Yorkshire Vikings' Tim Bresnan, on his way to 95 not out against Nottinghamshire Outlaws at Scarborough on wednesday in the Royal London Cup. Picture: Dave Williams. “THE magic of Scarborough,” purred one club official as he gazed at the bumper crowd inside North Marine Road. Officially, that crowd numbered 4,949, but there seemed many more to the naked eye. Man-of-the-match Tim Bresnan one of his two wickets agauinst Nottinghamshire at Scarborough. Picture: Dave Williams. 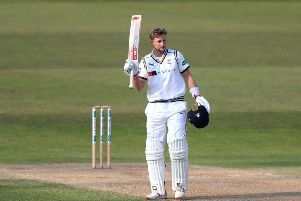 In what might have been the last county one-day game here for the foreseeable future, with changes afoot to the domestic structure, Yorkshire won a thrilling match by two wickets with two balls to spare. Victory kept them top of the North Group and all but booked their place in the quarter-finals. This was Yorkshire’s fourth successive One-Day Cup win, and it was particularly impressive for its hard-fought nature. After Notts scored 251-9, recovering well from 46-5, Yorkshire were themselves 50-4 before a stand of 97 between Adil Rashid and Tim Bresnan got them back in the game. Adil Rashid contributed a vital 41 for Yorkshire at Scarborough. Picture: Dave Williams. Rashid hit 41, but the key role was played by Bresnan, who went on to take Yorkshire home with a magnificent, one-day career-best 95 not out. Bresnan and Azeem Rafiq added 30 vital runs at the end, Rafiq hitting the winning boundary when he off drove Luke Fletcher towards the pavilion, while Bresnan was also the pick of the Yorkshire bowlers in another high-class all-round display. “I was just happy to take it deep and to be there at the end really,” said Bresnan. Bresnan deserved a hundred, but all that mattered to him was the end result. “I did have my eye on it at one point – until we got to needing about 30 runs,” he added. “I thought, ‘I don’t care who gets them here as long as we get over the line’, and Raf came in and played really nicely. On a murky morning, which later gave way to glorious sunshine, Bresnan grabbed the early wicket of ex-Yorkshire batsman Michael Lumb, caught at mid-off by Alex Lees, who had maintained his 100 per cent record at the toss in six One-Day Cup matches this year to go with eight successful tosses in his 11 T20 games. If the Yorkshire team have a National Lottery syndicate, it might be a good idea if Lees selected the numbers if he does not do so already. He certainly has a remarkable gift when it comes to the coin, and Yorkshire’s bowlers exploited the early assistance. Notts descended into disarray as Greg Smith pulled David Willey to deep mid-wicket before Bresnan struck again to have Brendan Taylor caught behind. Liam Plunkett trapped Samit Patel lbw and then had Riki Wessels caught at mid-on by Lees. Dan Christian and Steven Mullaney added 85 in 17 overs, Christian reaching 50 from 57 balls before falling to a wonder catch by Lees, diving at point off Steve Patterson. Chris Read edged Willey behind, but Mullaney reached a gutsy half-century from 75 balls. Rafiq had Fletcher stumped, and Patterson bowled Jake Ball to end a cameo that brought 27 runs from 16 deliveries. Mullaney hit 18 off the last over, finishing undefeated on 89 from 94 balls. Adam Lyth gave Yorkshire’s reply a flying start, smashing 39 from 26, but his departure to a catch at mid-on started a sequence that saw Yorkshire lose three wickets in seven balls. Travis Head pulled his second delivery to mid-on and Jack Leaning was caught behind off his third ball, both batsmen failing to trouble the scorers three days after they had hit 306 between them against Leicestershire. Yorkshire should have lost four wickets in nine balls but Rashid was dropped on two by Mullaney at second slip off Ball, a costly reprieve. The hosts did slide to 50-4 when Lees was caught behind after Mullaney parried the ball up at second slip, while Rashid eventually perished to a top-edged hook to long-leg. Willey was caught at deep mid-wicket and Plunkett taken at long-leg, Yorkshire falling to 224-8 when Hodd fell lbw. But the impressive Bresnan – strong on both sides of the wicket – and Rafiq in a fine support role, held their nerve as Yorkshire showed their character as well as their class.